Blin et al. report thermoresponsive double-crosslinked networks exploiting the Diels-Alder reaction. Double-network hydrogels (DN gels) consist of two interpenetrating networks that are bound together by covalent and reversible interactions and can resist high deformation by reorganizing their structure. Magnetic hybrid hydrogels in particular have attracted considerable attention owing to the possibility of triggering the properties of the hydrogels with an external magnetic field. Fontaine, Montembault and co-workers further contributed to this field by developing a novel class of thermoresponsive hybrid double-crosslinked polymer networks materials that can rearrange and rebuild upon triggering a Diels-Alder (DA) reaction. Central to this approach is the use of iron oxide nanoparticles as the nano-crosslinkers and difuran-functionalized poly(ethylene oxide) as the diene partner for the thermoreversible DA reaction. The thermoreversibility of the network was confirmed by 1H nuclear magnetic resonance (NMR) spectroscopy and rheological studies showing a fast gel/liquid state transition upon heating the sample. Importantly, the rheological properties of 3D networks with and without iron oxide nanoparticles were compared. The studies conclude that the presence of iron oxide nanoparticles in the network ensured that a gel-like structure was maintained after the retro DA reaction. These characteristics were attributed to the establishment of a secondary network through covalently integrated iron oxide nanoparticles. 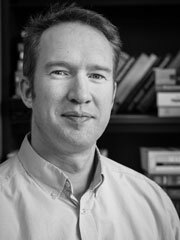 The unique combination of the Diels-Alder reaction with iron oxide nanoparticles to generate new reversible reticulated networks can pave the way for further applications mediated by magnetic hyperthermia stimuli. 1. The strategy used for the synthesis of difuran-functionalized diphosphonic acid terminated poly(ethylene oxide) by a combination of Kabachnik-Fields reaction and “click” copper-catalyzed 1,3-dipolar cycloaddition is a versatile method and poly(ethylene oxide) backbone can be replaced by a wide range of polymers that may bring new properties. 2. The formation of a 3D network via the Diels-Alder (DA) reaction with a trismaleimide is thermoreversible, with a faster retro-DA (rDA) reaction rate compared to the DA reaction, leading to an easier destruction of the 3D network than its formation. 3. The presence of phosphonic acid groups is needed to allow the crosslinking through interactions with the iron oxide nanoparticles and the formation of the 3D double-crosslinked network. 4. The 3D network is preserved even after the rDA reaction, demonstrating that the iron oxide nanoparticles serve as crossing points through strong bidendate Fe-O-P bonds. Furthermore, a gel-like structure is maintained at least in the limit of the percolation threshold. 5. The viscoelastic properties of the double-crosslinked gels demonstrates that the double-crosslinking leads to stiffer gels. Read the full article for FREE until 26th November! Polymer Chemistry 2019 Lectureship now open for nominations! Polymer Chemistry is pleased to announce that nominations are now being accepted for its 2019 Lectureship. 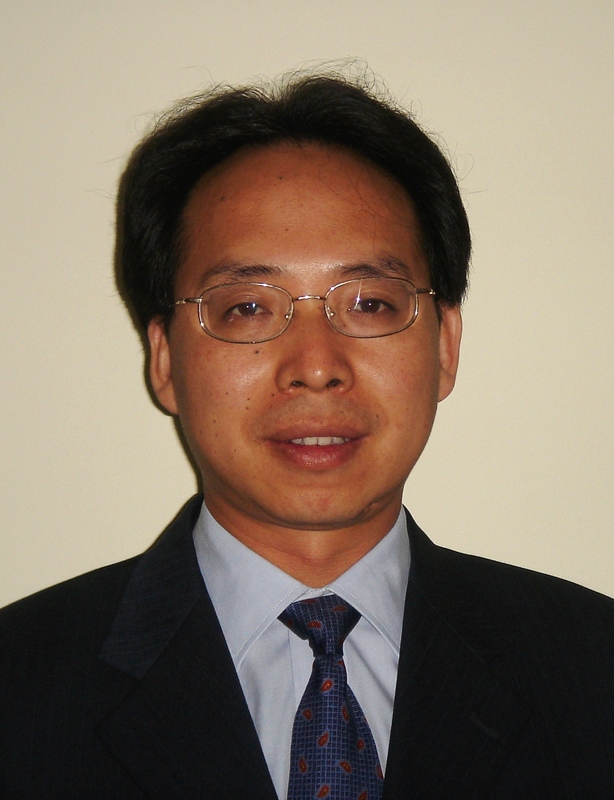 This annual award was established in 2015 to honour an early-stage career scientist who has made a significant contribution to the polymer chemistry field. The recipient of the award will be asked to present a lecture at an international meeting in 2019, where they will also be presented with the award. The Polymer Chemistry Editorial Office will provide financial support to the recipient for travel and accommodation costs. 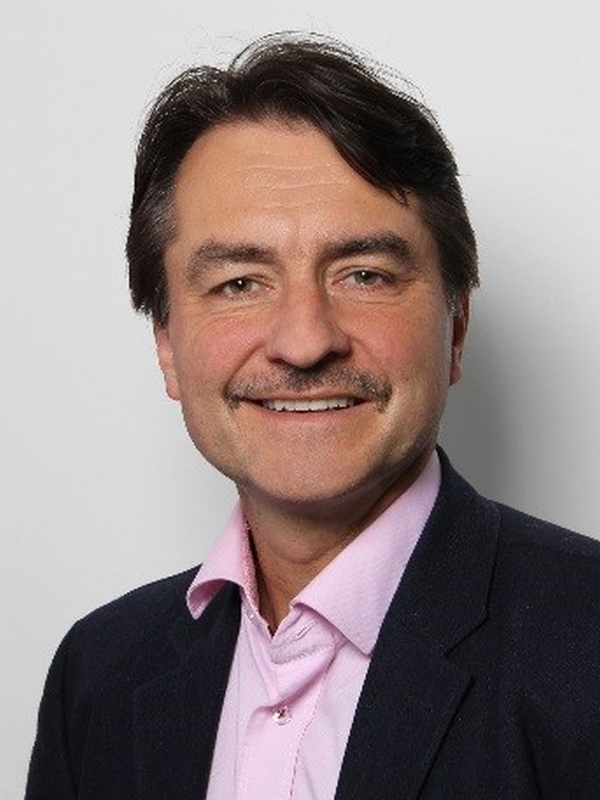 All eligible nominated candidates will be assessed by a shortlisting panel, made up of members of the Polymer Chemistry Advisory Board and a previous lectureship winner. 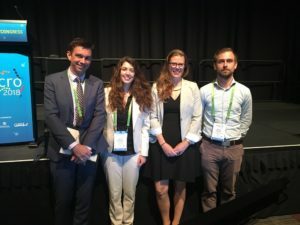 Shortlisted candidates will be further assessed by the Polymer Chemistry Editorial Board, and a winner will be selected based on an anonymous poll. Selection is not based simply on quantitative measures. 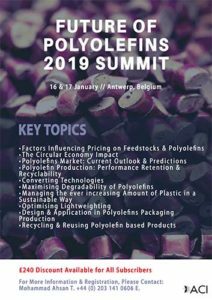 Consideration will be given to all information provided in the letter of recommendation and candidate CV, including research achievements and originality, contributions to the polymer chemistry community, innovation, collaborations and teamwork, publication history, and engagement with Polymer Chemistry. Worrell et al. report a useful guide to the thiol-thioester exchange in organic media. The thiol-thioester exchange is a common reaction in dynamic covalent chemistry. This reaction has been extensively optimized in aqueous media facilitating the widespread use in biochemistry and other bio-related applications. However, the utility of this reaction in material and polymer science is currently underexplored. This is possibly due to the fact that most polymer/material systems require organic media for their respective synthesis. To overcome this barrier and extend the scope and applications of thiol-thioester exchange, Bowman and co-workers explored this dynamic exchange in both small molecule and polymer analogues in a wide range of organic solvents. The effect of the pKa of the thiol and base employed, the electronic character of the thioester, the polarity of the solvent, the effect of the temperature and the nucleophilicity of the catalyst were thoroughly investigated. By judiciously choosing and optimizing all these parameters, the authors were able to tune the thiol-thioester exchange in both small molecules and subsequently network polymers to reduce applied stresses or change shape of the materials following polymerization. 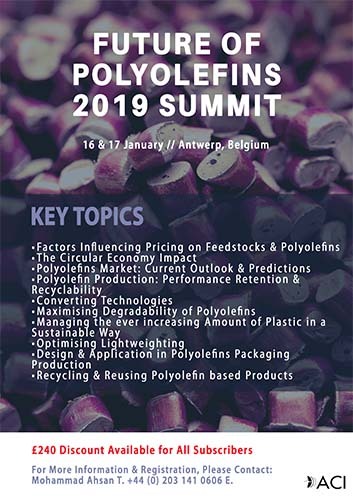 All these findings were thoroughly reported and explained by crafting an impressive “user’s guide” that can be useful for a large number of practitioners within the polymer/material community. The authors anticipate that the extremely robust, tuneable and responsive exchange reaction will further enable polymer/material scientists to develop new smart materials and will pave the way for further applications. 1. When comparing a panel of various thioesters exchanging with various thiols, the authors have found that thermodynamically the acyl group of a thioester prefers to rest on thiols of the highest pKa and will exchange rapidly to achieve this minima. 2. Base catalysts of a higher pKa form more thiolate and therefore promote the thiol-thioester exchange more rapidly in both small molecule systems and in crosslinked polymers, all things held the same. Base catalysts, if employed in larger concentrations, were, however, found to significantly retard the free radical thiol-ene reaction to produce crosslinked polymers. This can be overcome by optimizing the concentration of radical initiator (-photo, -thermal, or –redox) with respect to base. 3. Nucleophilic catalysts of a higher N-value (see Herbert Mayr’s work for more details on the calculation of this parameter) were found to promote the thiol-thioester exchange more rapidly in both small molecule systems and in crosslinked polymers, all things held the same. Unlike basic catalysts, nucleophilic catalysts did not show similar retardation in the free radical thiol-ene reaction to produce crosslinked polymers. 4. Due to polar intermediates formed during the thiol-thioester exchange reaction, polar solvents/matrices most effectively promote this dynamic exchange, especially with weaker bases. 5. Due to the low energetic barrier for the thiol-thioester exchange reaction, temperature does not have a great affect on the outcome of the exchange, however, it does improve the kinetics. 6. If the readers have any unanswered questions regarding this reaction, schemes for placing it into a polymer matrix, or other general queries, please direct them to brady.worrell@gmail.com and we’ll get to the bottom of it. Pankow et al. report the first copper catalyzed synthesis of conjugated polymers via direct arylation polymerization. Direct arylation polymerization is a useful methodology that allows for the preparation of conjugated polymers. One of the great advantages of this technique is that it eliminates the use of toxic and pyrophoric reagents typically utilized to prepare monomers for other polymerization methods (e.g. Stille, Suzuki, etc.). Importantly, the technique allows the preparation of polymers with undetectable levels of homo-coupling or branching defects leading to the defect free synthesis of a wide range of conjugated polymer architectures such as homopolymers, donor-acceptors copolymers and porous polymers. However, the vast majority of direct arylation polymerization methodologies rely on the use of noble metals such as palladium (Pd), which is a costly, low abundant, relatively toxic, and unsustainable metal. To circumvent this, Thompson and co-workers were inspired by the small molecule copper catalyzed aryl-aryl cross-coupling for various iodinated arenes and electron-deficient heterocycles. To transition from small molecules to conjugated polymers, the group judiciously optimized the reaction conditions including the concentration, the nature of the solvent, the ligand, the temperature and the base employed. Conjugated polymers were then prepared in very high yields (up to 97%) with Mn of up to 10 kDa. NMR spectroscopy was used to characterize the recovered polymer products and confirmed the absence (or minimization) of undesired couplings. This report is the first example of perfectly alternating donor-acceptor conjugated polymers using copper catalyzed direct arylation polymerization thus offering an initial step towards the replacement of toxic metals like Pd. Future work will hope to address milder reaction conditions, lower catalyst loading, and a broader scope. 1. Fresh CuI is recommended. It is recommended to acquire a fresh bottle or a freshly purified stock of CuI and store it under inert gas in a freezer. 2. The strict exclusion of air and moisture is advisable, and so care should be taken to thoroughly sparge the reaction vessel with inert gas before and after the addition of reagents. Glasing et al. 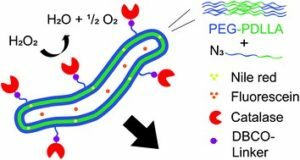 report the use of graft-modified cellulose nanocrystals as stimuli-responsive Pickering stabilisers. Renewable bio-based colloidal particles in emulsion-based products can be highly desirable as they can replace synthetic, small molecule surfactants. Pickering stabilisers or emulsifiers are solid particles that can be used as insoluble surfactants to stabilise emulsions. For such application, cellulose appears to be a good renewable biopolymer candidate owing to its abundance, sustainability and nontoxicity. Cellulose nanocrystals (CNCs) in particular exhibit little to no cytotoxicity and can thus represent a more sustainable and greener alternative to conventional surfactants. Cunningham and co-workers introduced new properties to cellulose nanocrystals by exploiting their graft modification with switchable poly((diethylamino)ethyl methacrylate) (PDEAMEA) and poly((dimethylamino)ethyl methacrylamide) (DMAPMAm). 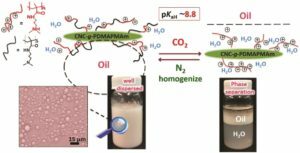 In this work, the use of well-defined graft modified CNCs with small amounts of grafted CO2-switchable PDMAPMAm and PDEAEMA as stimuli-responsive Pickering stabilisers for the reversible emulsification/demulsification of oil and water is thoroughly investigated. The obtained CNCs contained less than 25 wt% of grafted synthetic polymer and impressively resulted in stable Pickering emulsions with a shelf life up to one month without desulfating the CNCs or the introduction of ionic strength to the system. N2 and CO2 were used as environmentally benign triggers to stabilise the emulsions under N2 and break the emulsions under CO2. 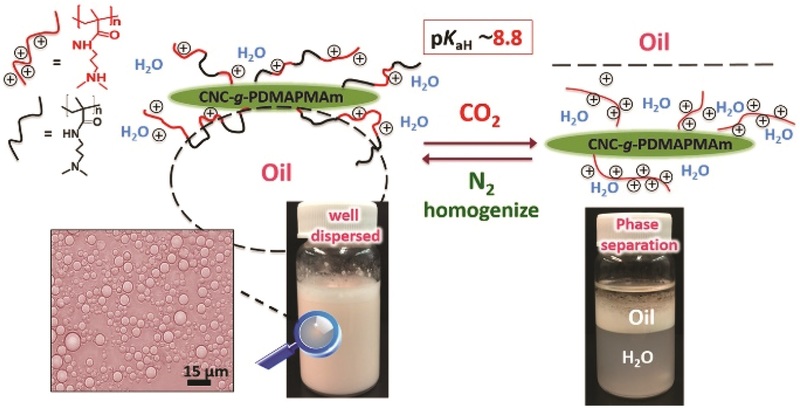 Importantly, the emulsification and demulsification were reversible and repeatable and the CNC-based Pickering emulsifier could be easily recovered, thus enabling it to be a potential candidate for oil harvesting applications. Such Pickering emulsifiers are not expected to have significant ecotoxicity compared to other conventional surfactants due to the CNCs and the polymer chains being too large in molecular weight to be bioavailable. The authors conclude that a higher fraction of hydrophobic copolymer in the grafts may further improve their system and enhance the adsorption of graft-modified CNC to the oil droplets and increase the emulsion stability. It can be difficult to ‘switch off’ PDMAPMAm at room temperature using N2, meaning deprotonating the tertiary amine groups in water. To ensure sufficient wettability of CNC-g-P(DMAPMAm-co-S) with the oil phase when homogenizing, i.e. a high enough degree of deprotonation, the temperature of the CNC dispersion has to be slightly increased first (~40°C, although this depends by the chain length) before adding the oil phase and preparing the emulsion. For the synthesis of the materials (Polym. Chem., 2017, 8, 6000–6012), it is important that premade polymers are living and purified from unreacted monomer, BlocBuilder and dead polymer chains. Any nitrogen-containing impurity will artificially increase the nitrogen content obtained from elemental analysis and thus falsify the final value for the amount of grafted polymer, graft density and amino groups per 1 g of CNC. It is thus advisable to repeat the purification/elemental analysis until a constant N value is obtained. SEM analysis of the grafted CNC (ESI) can be very difficult unless the appropriate conditions are chosen. CNC needs to be coated with conductive material as the polymer and CNC are both non-conductive. The materials were coated with 3nm osmium particles using a standard 30 micron aperture probe at 300V. The current corresponded to 275 pA at 10kV. Low current and low voltage conditions need to be chosen in order to visualize the structures. This paper is FREE to read and download until the 31st August! Dr. Athina Anastasaki is a Web Writer for Polymer Chemistry. She is currently a Global Marie Curie Fellow working alongside Professor Craig Hawker at the University of California, Santa Barbara (UCSB). Please visit this link for more information. The potential of nanomachines to mimic biological systems that can continuously move in and between cells to perform a function has attracted significant attention over the past decades. Although the autonomous movement, speed and functionality of various artificial nanomotors has improved over the years, it is interesting to note that the vast majority of them are based on catalytically active metals and harsh metal surfaces while requiring toxic fuel for propulsion. Wilson and co-workers are the first to report a biodegradable nanomotor which can autonomously move in the presence of fuel while carrying a load. To achieve this, Wilson’s group created poly(ethylene glycol)-b-poly(D,L-lactide) (PEG-PDLLA) polymerosomes with 5% wt% functional azide handles by employing ring opening polymerization. The spherical polymerosomes were then transformed to nanotubes by inducing osmotic pressure. The azide handles presented in periphery of the nanotubes were converted into COOH groups using strain-promoted alkyne-azide cycloaddition. Finally, catalase was coupled to the nanotubes surface via EDC coupling. Importantly, the catalytic conversion of H2O2 by the enzyme provided adequate propulsion to move the nanotubes forward. In addition, both hydrophobic and hydrophilic drugs could be simultaneously loaded in the tubes. Given the advantageous characteristics of tubular-shaped polymersomes, such as high-aspect-ratio and higher loading capacity, such materials can be potentially used as excellent nanocarriers for drug delivery. For the synthesis of PEG-PDLLA, keep the ratio of catalyst to initiator bellow 0.5 equivalents to obtain polymers with low PDI. Furthermore, the reaction is oxygen and water sensitive and should thus be carried out in inert atmosphere. The formation of polymersomes requires stable conditions, as small changes can affect the morphology and the polydispersity of the vesicles. Pre-cooled water is used for the shape transformation by dialysis while the dialysis is carried out in in the fridge at 4°C. Centrifugation of the nanotubes for functionalization reaction should not exceed 5000 rpm and should not be longer than 10 min to prevent aggregation and clogging of the spin filter and breakage of the tubes. It is recommended to use low concentration of nanomotors (< 109 particles/ml) when measuring their movement with the Nanosight LM10, as high oxygen production can lead to drift of the sample (dilute such that single motors are visualized). This paper is free to read and download until 6 August! Dr. Athina Anastasaki is a Web Writer for Polymer Chemistry. She is currently a Global Marie Curie Fellow working alongside Professor Craig Hawker at the University of California, Santa Barbara (UCSB). Please, visit http://hawkergroup.mrl.ucsb.edu/members/athina-anastasaki for more information. Genabeek et al. 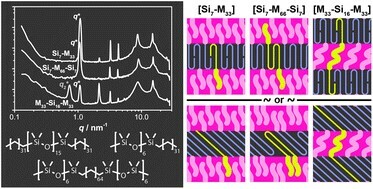 explore the self-assembly behaviour and impact of crystallinity in uniform block co-oligomers comprised of oligodimethylsiloxane and oligomethylene blocks. A long lasting challenge in polymer chemistry is to design new block copolymer combinations that allow a decrease of feature sizes and to propose models that describe the molecular organization within the microphase-segregated structures. A recently developed way to achieve this is through a new class of low molecular weight, discrete block copolymers (dispersity of 1). In this contribution, Meijer, Palmans and co-workers designed and synthesized a new class of discrete-length block co-oligomers comprising of oligodimethylsiloxane (oDMS) and oligomethylene (oM). By employing differential scanning calorimetry and small-angle X-ray scattering it was shown that all block co-oligomers exhibit microphase separation into well-ordered lamellar morphologies, driven by the crystallization of the oM blocks. Pre-melting order-order transitions were found for a number of block co-oligomers, resulting in an alternation of the oM crystal packing and in changes of the overall microphase-segregated structure. Importantly, uniform microphase-segregated domains were discovered and among them, one of the smallest domain spacing ever reported (dLAM=5.8 nm), highlighting that the combination of small feature sizes and structural perfection is unique for this type of materials. The authors also elegantly proposed models to describe the molecular organisation within the microphase-segregated structures. This was achieved by evaluating the changes in the lamellar thickness upon alternation of the block co-oligomer architecture. Such type of materials are of critical importance to fundamentally understand the molecular structure and the self-assembly of polymeric materials. The large difference between the affinities of oDMS hydride and oDMS with a silanol endgroup toward silica remains a useful tool to separate traces of starting material from the product during the oDMS synthesis. Secondly, the large difference in solubility of short (< 11 repeat units) and long (> 11 repeat units) siloxane oligomers was used frequently to purify the materials. During the synthesis of the oM blocks, we routinely used a two-stage protection and deprotection protocol of the cyclic ethylene acetal via a dialkyl acetal intermediate. Thus, stages involving the free aldehyde could be conducted at room temperature, minimizing the risk of degradation of the aldehyde functionality, which otherwise might led to inseparable side-products (e.g., the result of unwanted condensation reactions). To ensure good solubility of the oM blocks, a molecular design containing at least one double bond per 30 carbon atoms is advised. Crystallisation kinetics in oDMS–oM and related systems generally are very fast. In a select number of cases we clearly noticed the benefits of very slow (< 0.1 °C min-1) cooling from the melt in order to decrease the number of defects/increase the size of the crystalline domains in the phase-segregated systems.